Curious kids try to explore everywhere, but the Safety 1st OutSmart Lever Lock helps you keep them safer with the first ever decoy button. 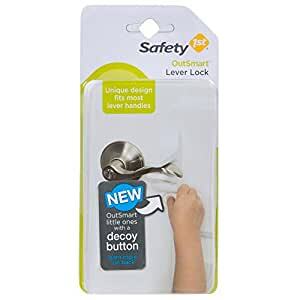 Your child will think the decoy button will let them open the door, but pushing it has no effect. You’ll know that the surface on the sides hides the actual secret to opening the door. The Lever Lock is a clever way to prevent your little explorer from accessing off-limit rooms. It installs easily and can be operated by an adult with a squeeze on the hidden buttons built into the hinge. The decoy button won’t do anything when pushed, but adults in the know can easily open the door.